Mobility is the lifeblood of every city. As cities everywhere grow, and as more megacities emerge, leaders face a growing challenge: providing an adequate transportation infrastructure and offering mobility choices that serve the public’s needs and support economic vitality. With the advent of new vehicle technologies and business models comes an array of new possibilities. Autonomous vehicles (AVs), ride hailing (services provided by companies like Uber and Lyft), ride sharing (such as UberPool and Lyft Line), shared vehicle ownership, electric vehicles, and other recent developments do more than promise solutions to overburdened public-transit systems and congested roads; they also hold out the prospect of improved safety, more efficient transportation spending, cleaner air, and greater productivity. Together, these developments will reshape the urban landscape and help define the future of transportation. public-transit-centric European archetypes. In addition, the city’s harsh winter weather and irregular physical layout would help test the limits of AV technology. And last, though certainly not least, Boston’s long-term transportation vision, part of its Go Boston 2030 initiative, is particularly detailed and thoughtful. 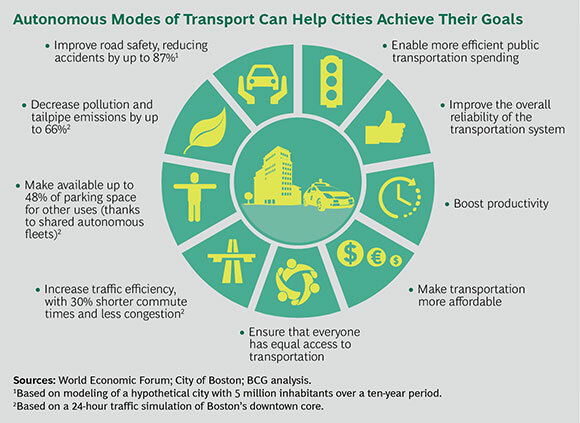 This report, BCG’s latest on autonomous vehicles, examines the case for AVs as a cornerstone of the urban mobility revolution, as seen through the experience of Boston. It describes transportation challenges, strategic considerations, scenario modeling and simulations, and field testing. We hope that leaders in the public and private sectors who are considering new urban mobility models will benefit from these reflections and recommendations on Boston’s experience thus far. Transportation in Boston has seen dramatic changes over the course of the city’s nearly 400-year history: from horse-drawn wagons to streetcars, from the first American subway to the first car-sharing service. Today, in a city widely regarded as one of the most walkable in the United States, 14% of residents (a relatively high proportion) choose walking as their primary mode of local transportation. But a huge influx of commuters—primarily drivers—causes the city’s weekday population to swell to more than 1 million, almost double its resident population. Traffic congestion chokes the city’s roadways, creating delays during peak hours and leading to what some experts consider to be among the nation’s worst driving conditions. Boston is growing robustly in both population and jobs. But opportunities in this healthy economy are less available to the city’s poorer residents: public transit tends to offer better service in more affluent neighborhoods, while underserving low-income neighborhoods such as Roxbury (median annual income, $32,000). Because residents of poorer neighborhoods must walk farther to reach the nearest subway line, they tend to rely more heavily on other modes of transportation, such as private cars. The city’s vibrant economy has strained the public-transit system to capacity. And the expansion of the tech, health care, and education sectors in the northern, southern, and western suburbs has created a need for connections between neighborhoods and these new economic hubs. Weather—especially Boston’s severe winter conditions—compounds the pressure on the city’s public-transit system and infrastructure. Each year, on average, Boston copes with about 43 inches (1.1 meters) of snow; in the winter of 2014 to 2015, a record 110 inches (2.8 meters) fell on the city. Of the ten most populous US cities that experience cold winters, only Denver, Minneapolis, and Milwaukee receive higher average amounts of snowfall (55 inches for the first two cities, and 47 inches for Milwaukee). Access. Make Boston’s neighborhoods interconnected for all modes of travel, including cycling, walking, and car sharing. Safety. Eliminate traffic fatalities in Boston, and significantly reduce collisions in all modes of travel. Reliability. Make travel on Boston’s transit and roadway networks predictable under all conditions. Families feel that they lack adequate alternatives to using a private car. Yet using one’s personal car in downtown Boston is hardly desirable because of traffic congestion and the high cost of parking. People who cannot afford to own or drive their own car often spend hours on public transit. For some, this means having all of their children in tow, on a lengthy journey by public transit, in order to bring just one child to a doctor’s appointment. Residents had mixed feelings about existing public-transit options. Many are unhappy with the perceived unreliability of the system, which in large part stems from poor communication regarding service disruptions. For many, ride-hailing services such as Uber and Lyft today fill a gap between public transport and privately owned vehicles. Reduce solo private-car use by half, to 20% of the total number of work commutes. Increase public-transit use by one-third, to 44% of the total. Increase walking by approximately 50%, to 22% of the total. Boost cycling fourfold, to 8% of the total. Although they are aspirational, these targets are measurable, and city leaders established them in order to encourage an aggressive course of action to drive change. As part of Go Boston 2030, the city is pursuing several early-action projects designed to quickly improve how people get around. These include Vision Zero Boston, which aims to eliminate traffic fatalities in the city through greater pedestrian and bicyclist safety, and a citywide rollout of 5,000 smart parking meters that provide real-time data to better manage parking and curbside space. Boston’s Autonomous Vehicle Initiative, a joint effort with BCG and the World Economic Forum, is one of the city’s medium-term transportation projects. Announced in September 2016, the initiative involves the on-street testing of autonomous electric vehicles. Recognizing the many potential societal benefits of AVs (whether private or shared-fleet), city leaders designed the initiative to develop a strategy to get them on the road. (See the sidebar “The Social Benefits of Autonomous Vehicles.”) Within three months, the city had moved to establish a strategy, governance structures, and programs for testing and implementing the new technologies and business models. Greater Safety. Many crashes and fatalities today occur because of human error. AVs can dramatically reduce the risk of crashes. According to a fleet-based model of a city with 5 million residents, the number of crashes could decline by as much as 87% over a ten-year period. More Available Public Space. AVs significantly reduce the need for nearby parking spaces (or any parking spaces, in the case of shared vehicles). This frees up urban land for other public uses, such as parks or recreational facilities. Reduced Congestion. Increased throughput and smoother traffic flows (as a result of more efficient driving and fewer crashes) will help reduce congestion. As ride sharing increases and fewer cars fill the streets, the reduction may be even greater. On the other hand, a rise in demand for AV mobility (due to the availability of a more convenient, more affordable transportation option) and an associated rise in miles traveled could partially offset these benefits. Greater Access for Nondrivers. AVs increase the mobility of people who are unable or unwilling to drive, such as the disabled and the elderly. Although most cities today offer paratransit services, these tend to be costly to maintain. More Reliable, Less Stressful Transportation. The efficiency and convenience of autonomous technology improve travel for city dwellers. By reducing congestion, AVs can make transit times more predictable. Cost Efficiency. Shared AV-based transportation will likely be considerably cheaper than car ownership is today—and potentially competitive with the cost of mass transit. One factor in this cost efficiency is the reduction in labor costs. Another element is the economic effect of ride sharing: splitting the fare among multiple passengers. Ride sharing in a robo-taxi that carries at least four people would be roughly half as expensive as driving one’s own vehicle. Greater Productivity. Because they encounter fewer traffic bottlenecks, commuters spend less time traveling and can use that travel time more productively. If they choose to, AV passengers can read or work during the trip, thus boosting their productivity. * This assessment does not take into account the impact of upstream emissions related to increased demand on the electrical grid. Our base case assumes that 56% of the trips starting, ending, or occurring entirely within the 0.45-square-kilometer study area involve public transit, 33% involve a traditional personal vehicle, and 11% involve taxi or ride-hailing services. To simplify the scenarios, we excluded walking and cycling from our modal mix. Scenario A, the evolutionary scenario, assumed a substantial shift from traditional to autonomous privately owned cars and a steady increase in the use of shared modes of mobility. Specifically, it assumed that 11% of trips would be by traditional private car, another 11% by privately owned AV, 50% by public transit, and 22% by ride-shared AV taxi. Traditional taxis and ride-hailing account for the remaining 6% of trips in this scenario. Scenario B postulated a revolutionary change from privately owned vehicles to the on-demand use of electric AV fleets. This scenario assumed that 34% of trips would be by public transit, 24% by single-passenger AV taxi, 14% by ride-shared AV taxi, and 28% by AV shuttle bus. In terms of traffic flow, both simulations yielded less congestion and shorter travel times. (See Exhibit 3.) In the evolutionary scenario, the number of vehicles in the study area fell by 11% (largely as a result of more car sharing and ride sharing). Travel time dropped by an average of 11%. In the revolutionary scenario, the number of vehicles in the area fell by 28%, and average travel time declined by 30%. A Drop in Emissions. In the evolutionary scenario, tailpipe emissions fell by 42%; in the revolutionary scenario, they fell by 66%. For both scenarios, we assumed that most autonomous vehicles—roughly half of privately owned AVs, two-thirds of autonomous taxis, and all autonomous shuttle buses—would be electric and thus free of tailpipe emissions. Recovered Street Space. The presence of fewer private cars in the study area reduced the need for parking spaces. The evolutionary scenario showed 16% more free space in the area, while the revolutionary scenario produced almost 50% more space. Our assumption underlying this reduction is that shared vehicles require a fraction of the current number of parking spots for passenger pickup and drop-off and for vehicle charging, because they either return to their point of origin or go to a parking space that is farther from the core (and thus less expensive than downtown parking). In summary, the results of the simulations support the argument that in dense urban environments, the transition to shared, AV-enabled modes of transportation could relieve congestion—owing to fewer vehicles on the streets and smoother, more organized traffic flows that involve less stop-and-go driving and fewer of the other interruptions typical of human driving. Our modeling exercise also demonstrates the importance of active planning, policymaking, and management in advancing transportation outcomes that meet the public’s diverse needs and minimize unintended consequences. AVs provide effective transportation options that serve people better. Their benefits include facilitated mobility for significant segments of the population—in particular, the elderly and people with physical disabilities. At the same time, AVs risk becoming victims of their own success, increasing the demand for transportation by making mobility cheaper and more convenient. When people use AVs more often and in an ad hoc manner—to run simple errands, such as picking up the dry-cleaning, for example—the result could be more, not less, traffic congestion. Greater congestion could also result from a rise in certain types of zero-occupancy trips, such as when empty AVs cruise the streets to save on the costs of parking. Another potentially undesirable outcome relates to the impact of AVs on the transportation labor market: AV fleets might put taxi drivers and other transportation workers out of work. (In their AV-related discussions and actions, Boston’s leaders have recognized the importance of job retraining and job creation for those workers.) Finally, AVs could contribute to urban sprawl if commuters conclude that they can live farther out of town because commuting to work has become faster, less stressful, and more comfortable. All of these possibilities underscore the need for public-sector managers and leaders at the city, county, and state levels to participate in formulating a transportation strategy that includes autonomous transportation modes, yields the greatest benefit to the largest number of stakeholders, and avoids undesirable outcomes. What policies and incentives should we put in place to ensure that our new mobility models contribute to our overall transportation goals? How can we overcome existing concerns about safety, liability, and ethics in order to advance the public’s acceptance of AVs? What is the optimal mix of public-transit and new mobility models, and how do we achieve it? How can we use pricing and taxation to influence this balance? What is the most effective way to encourage ride sharing, a transportation option that is critical to realizing the long-term societal benefits of AVs? How do we discourage inflating demand for zero- and single-occupancy road-based transportation? What restrictive laws and penalties can we implement to minimize these unwanted outcomes? Where should we test the new mobility models? Where should we first roll them out? Should we establish dedicated AV zones or lanes and similar incentives for use? Boston’s AV initiative seeks to address these and other pressing questions. Strategic discussions initiated by city leaders, BCG, and the World Economic Forum point to some answers. In its early stages, Boston’s Autonomous Vehicle Initiative has already yielded five important lessons for policymakers, planners, and other private- and public-sector stakeholders involved in shaping the future of mobility in their city. Autonomous Private Vehicles. The prevailing view among consumers is that most privately owned, privately driven autonomous cars will be electrically powered (or at least hybrids). Electric and hybrid power trains will certainly help reduce tailpipe emissions (and thus help mitigate climate change), but the precise “well-to-wheel impact” will depend on developments in electricity generation. Private AVs could also contribute to safer roads. Without a shift to shared vehicle usage, however, they are likely to have only a limited impact on urban mobility in terms of reducing congestion or providing better, more affordable transportation. Autonomous Taxis. Autonomous taxis can serve either a single passenger or multiple passengers (strangers who share the ride, similar to UberPool today). These vehicles transport passengers from a designated pickup point to a designated destination. NuTonomy—an MIT spinoff technology company and a partner in the Boston pilot program—has launched a prototype autonomous taxi. The company launched the world’s first test program involving autonomous taxis in Singapore in August 2016. It is now developing a complete solution for point-to-point mobility via large fleets of AVs, using a package that consists of software programs for navigating urban environments, routing and managing vehicle fleets, and operating vehicles by remote control. NuTonomy previously tested the software in the UK and is now testing it in Boston and Singapore. Autonomous Shuttle Buses. More and more vehicle manufacturers are looking at electrically powered, autonomous shuttle buses as a crucial building block of future urban mobility. Several manufacturers, including France-based Navya and US-based Local Motors, are building and deploying such buses today on predefined routes or in geofenced areas (geographical zones defined by a perimeter within which a suitably equipped vehicle can track its route and its proximity to other specified locations via GPS or Wi-Fi). Navya’s 15-seat Arma, which the company introduced in October 2015, is already in use on public streets in Bordeaux and Lyon (France), Sion (Switzerland), Doha (Qatar), and Perth (Australia). Launched in the summer of 2016 and built with direct digital manufacturing and 3-D printing, Local Motors’s eight-passenger Olli features IBM’s Watson artificial intelligence system. Arma has a maximum speed of 40 kilometers per hour, and Olli a maximum of 45 kilometers per hour. Eventually, autonomous shuttle buses may be able to operate independently of predefined routes, much as UberPool and Lyft Line do today, calculating nearby pickup and drop-off points for passengers based on optimized routing. This capability would enable them to serve as a convenient middle option between a private ride-hailing service and public transportation. To improve efficiencies in the transportation network and in the services they provide to residents, cities will likely encourage a combination of these new transportation modes. For example, shuttle buses could complement public transit by taking residents of sparsely populated areas to the nearest commuter rail or subway station (thus bridging the last mile). And autonomous taxis could serve elderly and mobility-impaired passengers end to end within the city. Underlying many of these models is the assumption that residents will not mind sharing rides, even in the absence of a human driver, with passengers whom they do not know. In our research, we have seen some degree of reluctance about sharing rides, particularly in Western countries. But pricing advantages can change that equation, as real-world experience demonstrates. In both New York and San Francisco, for example, one-third of Lyft’s trips today involve ride sharing through its Lyft Line service. Any evaluation of a new mode of transportation must take into account the city’s particular context and needs. The case for new shared-mobility transportation options on routes and between neighborhoods that currently lack public transit is clear. But for areas that public transit does serve, planners and policymakers must consider how new mobility models can complement existing infrastructure to provide better first- and last-mile connections to and from major rail lines. As it does in many cities around the world, mass transit serves as the backbone of Boston’s transportation system. Although some of the city’s recent job growth has taken place outside the downtown area, most of its transit options remain concentrated there. As a result, to reach an outlying workplace, passengers from neighborhoods outside the city center have to get downtown, transfer, and then travel back out to their destination. Transit planners could eliminate this inefficient, time-consuming situation by creating direct AV routes from residential neighborhoods to the districts in which new jobs are located—without committing to a major investment in rail infrastructure. Cities do not have to own or even operate the new mobility assets; they need only enable deployment. This is the situation in Boston and, probably, in most other cities that must grapple with competing budgetary demands. Establishing the right policies and regulatory environment in close cooperation with industry leaders, technology developers, and government officials at the local, regional, and state levels is one key step. Approving the technologies and testing the models on the city’s streets is another. In surveys that we conducted among 25 city policymakers worldwide in 2015, roughly 90% of respondents said that they would rather have multiple private-sector entities offering new, autonomous mobility services than rely on the city or on a single private provider. (See Self-Driving Vehicles, Robo-Taxis, and the Urban Mobility Revolution, BCG report, July 2016.) Any third-party mobility offering, however, would need to conform to the city’s critical planning goals—which in Boston’s case are to make transportation safer, more accessible, and more reliable. Meanwhile, the city will gather data on current usage of all transportation modes and use that information to steer traffic dynamically (based on real-time traffic conditions), plan, and maintain the street network more effectively. Such a system does have challenges, including the issue of integrating vehicular, pedestrian, and public-transit traffic that flows in from surrounding communities. Designing, building, and operating a system that both city residents and commuters from outside the city can use will require substantial intraregional cooperation, coordination, and co-investment, too. Third-party providers will likely play a significant role in formulating an effective plan. In June 2017, the Finnish company MaaS Global (MaaS stands for mobility as a service) began testing Whim, a subscription-based app, in Helsinki. The app enables users to plan trips incorporating transportation options from different providers—local public transit, rental cars, city bikes, taxis, long-distance trains, and more. Users can buy monthly packages or pay as they go. Field testing of Whim will begin in the West Midlands in the UK next. Cities must take ownership today of managing their future mobility ecosystem. From the outset, cities should establish a governance structure and testing policies and parameters that will foster the kinds of innovative solutions they need to solve their most pressing transportation challenges. Cities can make considerable progress toward achieving such solutions by working cooperatively with state or national agencies. In 2016, Boston quickly adopted several measures to drive AV development forward: the launch of its initiative with the World Economic Forum and BCG; an executive order from Mayor Martin Walsh establishing AVs as a priority and naming Gina Fiandaca, the commissioner of Boston’s Department of Transportation, to lead the city’s AV effort; and a memorandum of understanding with NuTonomy and the Massachusetts Depart-ment of Transportation (MassDOT) that confirmed their joint commitment to begin on-street testing and defined the scope of the tests. Singapore offers another example. In 2014, the country’s Ministry of Transport formed the Committee on Autonomous Road Transport for Singapore (CARTS), a public-sector/private-sector task force charged with guiding the development of AV use. CARTS working groups are exploring an array of issues, from new technologies to business models and suitable regulation. Singapore. Since 2015, Singapore has been running AV bus and taxi trials in its One-North business zone. Participants include NuTonomy, A*STAR’s Institute for Infocomm Research, the Singapore-MIT Alliance for Research and Technology, and Delphi Automotive. In June 2017, Singapore announced that it would expand the program, adding 55 kilometers of test route to penetrate neighboring areas that include mixed-use residential developments. Helsinki. Following trials in the summer of 2016, the city plans to offer regular, scheduled autonomous shuttle–bus service in the fall of 2017 with EasyMile EZ-10 vehicles, which transport up to 12 passengers. Other Finnish cities are conducting their own self-driving trials. London. In March 2017, the UK government announced plans for the first phase of its £100 million investment to build infrastructure for developing and testing autonomous driving technology. As part of London’s GATEway Project, researchers in April 2017 tested an autonomous Oxbotica-made shuttle prototype on a 2-mile (3.2-kilometer) route near the O2 arena in Greenwich. Wuzhen. In November 2016, Baidu, the internet giant, began field-testing autonomous cars manufactured by Chinese automakers BYD, Chery, and BAIC Motor in a public trial in the tourist city of Wuzhen. In April 2017, the company launched its Apollo Project to open its vehicle, hardware, and software platforms and cloud data services to car manufacturers and others in the industry. Suzu. In February 2015, this Japanese city of roughly 15,000 people, 44% of them elderly, began public road trials in a joint AV transportation project with Kanazawa University. The main test route of 6.6 kilometers ran from the city to the mountains; a second test route was 60 kilometers, the longest in Japan. In 2017, the city will have conducted two social trials, including a public demonstration at the Oku-Noto Triennale festival in September. Plans call for a regional launch in 2020. Boston’s leaders moved with impressive speed from exploring the idea of AVs to conducting the first on-street tests. (See Exhibit 5.) They were able to do so because the city quickly put enabling measures in place: after issuing executive orders, it forged a partnership with a pioneering technology provider (NuTonomy), built a website to communicate its plans, and simultaneously developed the testing plan and the memorandum of understanding with NuTonomy and MassDOT. Massachusetts acted swiftly, too, authorizing testing on the state’s roads and creating an Automated Vehicles Working Group under the leadership of Secretary of Transportation Stephanie Pollack to support AV innovation in Massachusetts. The first tests started promptly with a narrow, well-defined scope; over time, the testing conditions and area will gradually expand. Throughout the testing period, Boston plans to use earlier lessons to inform the next steps, even if successive iterations of the testing regimen contain substantial changes or adaptations. In Boston, close cooperation between and coordination with all city and state stakeholders has been the key to progress thus far. Involved parties include, among others, Chris Osgood, the mayor’s Chief of the Streets, Transportation, and Sanitation (a cabinet-level post overseeing public works and transportation); the Mayor’s Office of New Urban Mechanics, which is the city’s civic innovation team, led by Kris Carter and Nigel Jacob; the Boston Department of Transportation; the Massachusetts Bay Transit Authority; MassDOT; and the Massachusetts Port Authority. The MassDOT Automated Vehicles Working Group is focusing on proposing statutory and regulatory changes that will facilitate the widespread deployment of AVs in the state while also ensuring public safety. Similar work is essential for any city that is considering wide deployment of AVs in its streets. At the same time, lessons from Boston’s experience with NuTonomy feed back into the working group to inform policy decisions at the state level. Through the on-street trials, Boston is testing different technologies, experimenting with different business models, and gaining an understanding of the infrastructure requirements for AVs. The resulting findings will help leaders develop the combination of technology, business models, regulation, and infrastructure that best fulfill the city’s particular needs. Working with multiple industry partners is at the core of this strategy. The city kicked off its testing with NuTonomy. (See the sidebar “An AV Progress Report.”) As of 2017, however, it is also working with several other mobility providers—including Optimus Ride (like NuTonomy, a startup that emerged from MIT) and Delphi Automotive—to test their products on Boston’s streets. To underscore its desire to be fair and transparent, the city posted a draft memorandum of understanding on its AV website to give interested parties a clear view of its selection process. In November 2016, the City of Boston, the Massachusetts Department of Transportation, and NuTonomy signed a memorandum of understanding authorizing the Cambridge-based AV software maker to conduct tests on Boston’s public roads. The Boston program represents the company’s first testing ground in the US, after it launched its autonomous taxis in Singapore in 2016. City leaders worked with NuTonomy to develop a testing plan, which was implemented in January 2017. The initial on-road test phase called for 100 miles of driving on public roads within the Raymond L. Flynn Marine Park at the Boston Seaport during daylight hours in good weather, followed by 100 miles of driving (in the same park) at night and in inclement weather. Throughout the tests, a safety driver was in the vehicle to monitor it and to assume manual control whenever he or she felt uncomfortable or thought that other vehicles might behave unpredictably. This test phase, completed in March, enabled researchers to identify a set of technical challenges that the software must overcome before AVs can operate commercially as an on-demand service. Among the software’s tasks are to learn how to recognize Boston’s articulated Silver Line buses; maneuver around heavy equipment at construction sites and industrial operations; navigate a tricky intersection where vehicles routinely block the box; share the road with vehicles traveling much faster than the 25-mile-per-hour speed limit; and learn how to correctly identify seagulls, a common presence on Boston’s waterfront and an obstacle the AV had not encountered in its Singapore trials (gulls were difficult for the AV’s cameras to identify because they look different when viewed singly than when viewed in a flock). The next phase, which launched in April 2017, expanded the testing area to the entire Seaport District. One of the most important new challenges of this phase is the task of navigating the area around South Station, one of the two busiest commuter train stations in Boston. In addition, NuTonomy announced a partnership with ride-hailing provider Lyft to jointly test autonomous rides in the city. Informing and educating the public about autonomous vehicles is as important as validating the technology itself. Leaders recognize that many people have reservations about AVs, and they understand the need to publicize AV transportation in order to encourage its adoption by residents. Offering residents “AV 101” sessions or free rides can help familiarize them with AVs and generate interest and excitement. Boston took measures early on to publicly float the idea of autonomous transportation. During the Go Boston 2030 planning process, city representatives engaged through surveys, forums, and discussion groups with more than 5,000 residents. Press announcements and interviews with city officials have helped promote the AV effort. The city also created a website dedicated to autonomous vehicles, and the city’s AV initiative is a central part of its effort to earn residents’ acceptance and support for its broader mobility program. The website outlines the city’s vision, the benefits it expects AVs to deliver, and the rationale for its partnership with NuTonomy. Promotional events, such as a block party showcasing robotics (with an AV “petting zoo”) set for October 2017, aim to promote public enthusiasm for AV transportation. Similarly, MassDOT is acting with transparency by opening its Automated Vehicles Working Group sessions to the public. The ongoing vehicle tests are currently limited to NuTonomy employees, but researchers may open them to passengers outside the company in the future—a further step in socializing the new technology, and one that will generate direct consumer feedback. Like the transportation programs in Singapore, Gothenburg, Helsinki, and other leading municipalities, Boston’s effort demonstrates how a city can work carefully, deliberately, and above all safely to prove the viability and potential of AVs and AV-enabled business models. Its progress so far confirms what many experts involved with AVs and cities have long believed and some have since partly confirmed: the potential benefits of AVs in urban transportation systems are enormous and wide-reaching, but achieving them requires the right mix of ambition, planning, regulation, testing, and careful execution in a setting that involves multiple stakeholders.